Less than a year since VidZone launched on June 11 2009, the team are extremely excited to announce VidZone TV. VidZone has racked up over 3 million users since it was released, with over 350 million videos streamed. 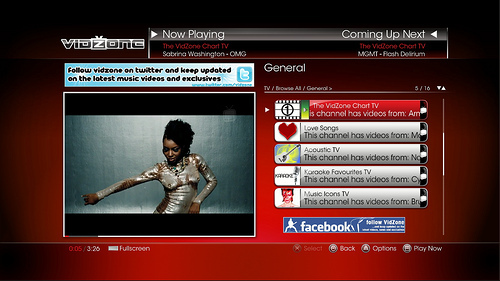 The new addition, VidZone TV, features over 100 music TV channels all of which can be played back on demand. 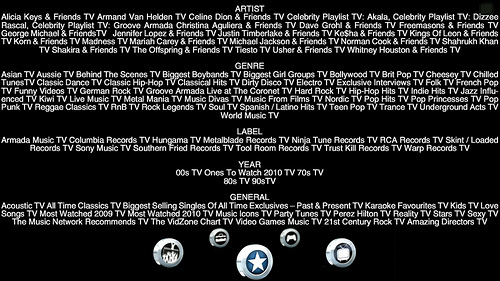 VidZone TV gives you all the music you can wish for. Channels will fall under 5 categories – Artist, Genre, Year, Label and General (for everything else!) The TV channels will be pre-programmed and not connected to a live stream. New main menu carousel – Sparkly brand new look carousel screen for selecting links to VidZone: TV, Featured, On Demand, Settings and upcoming other new upcoming features. Search function is improved – It is now possible to perform ‘like’ searches – e.g. “Kill” for The Killers. In-store game purchasing – Purchase selected PlayStation Store games / content advertised in VidZone without exiting the VidZone application. Full screen experience enhanced – It’s now possible to see which video is coming up next. There is also a key for all functions and ticker bar available to provide valuable information to users about new/must see content. Video of The Day TV – The music industry is helping us offer one ultimate video of the day, every day. It will play immediately after opening the application. Clickable pre-rolls – Some pre-roll advertisement videos are now clickable and launch the Internet Browser. Title changes – “Related Videos” has been renamed to “More by this Artist” “Home Page” renamed to “Featured”. Email settings – It’s now possible to sign up or unsubscribe to emails in Settings > Help menu. If you want to receive updates or competitions from VidZone you need to be registered by email. Ive been having a play with the new version and i cant seem to skip tracks anymore? ?